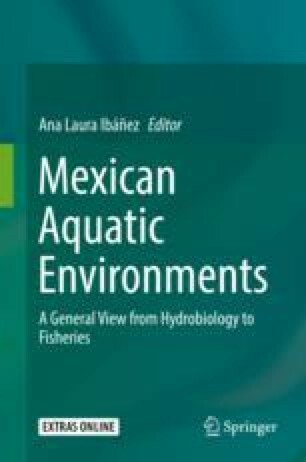 In order to contribute to the knowledge of the normal spatiotemporal ranges of physicochemical and biological parameters in lagoons, estuaries, marshes, and Mexican bays, an extensive search of information was performed, and this will allow us to present the normal ranges of variation for the following parameters, salinity, temperature, pH, oxygen, nutrients (nitrogen and phosphorus), and phytoplankton biomass (chlorophyll a), which have an ecological significance and can even be considered by some as indicators of water quality. We will include the average, minimum, and maximum values of these variables of 75 coastal environments of our country based on published studies from 1968 to 2017. The information will be put in the context of regional environmental characteristics for each system. This information will be helpful in the analysis or diagnosis in future environmental studies and will avoid the use of foreign standards based on different environmental and socioeconomic conditions. The online version of this chapter ( https://doi.org/10.1007/978-3-030-11126-7_3) contains supplementary material, which is available to authorized users.